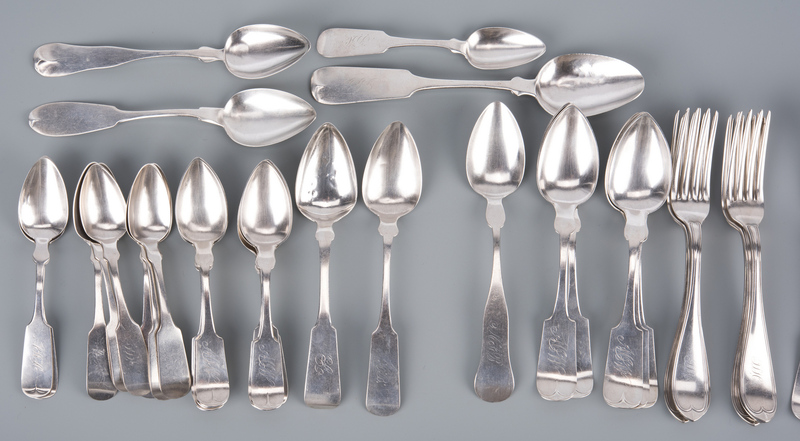 Large group of assorted American coin silver from Northern and Midwestern silversmiths, 54 pcs. Includes 6 Fiddle Tipt pattern forks, marked for Knowles & Ladd (Providence, Rhode Island, circa 1850s), monogram AC; 11 Fiddle Tipt pattern forks, marked Pure Coin and B. Pitman in rectangle, monogram LFJ; 6 forks in a threaded pointed oval pattern, marked James Watson and Coin with horse head and chevron pseudohallmark (working Philadelphia, 1821-1872), monogram JSH; 2 small forks (5 1/2" L) marked for Edwin Trask (working Galesburg, Illinois, mid 19th c.); 5 dessert spoons and 6 teaspoons with Fiddle Tipt handles marked J.R. Reed (James R. Reed, working Pennsylvania, c. 1840), monogram MJW; 7 Fiddle pattern teaspoons marked Henry Evans in rectangle (working Newark, NJ, 1835-1862), monogram JSH; 5 Fiddle Tipt teaspoons marked for Wood and Hughes and J.E.M., monogram AWH; 1 table spoon marked Oakes (attr. 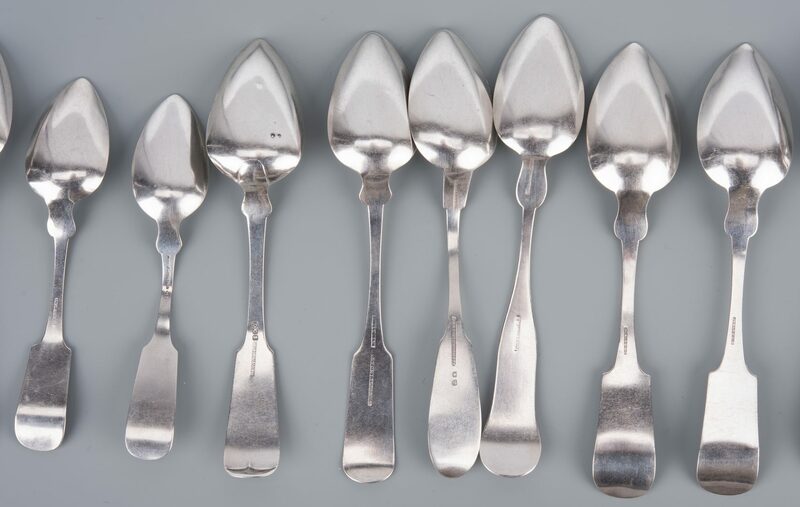 Henry Oakes, working Hartford, CT 1830-1842) and 5 assorted dessert spoons in Fiddle and Fiddle variant patterns with marks for makers Coe & Montgomery; W.W. Hannah; Pitkin/Nortom & Freeman; L. Eaton; and R.H. _ Woodstock, VT. 57.86 oz troy combined weight. 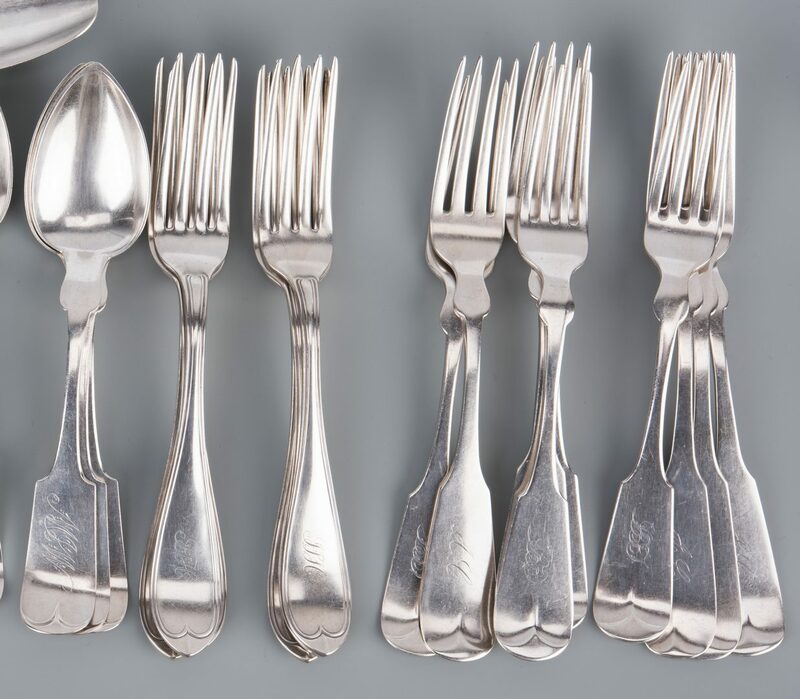 Provenance: The estate of Peter Fyfe, Nashville, TN. 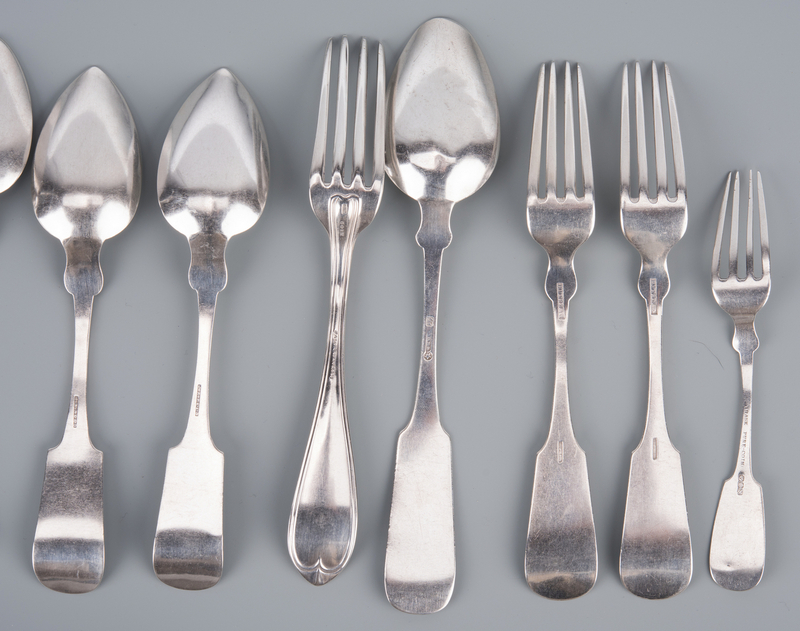 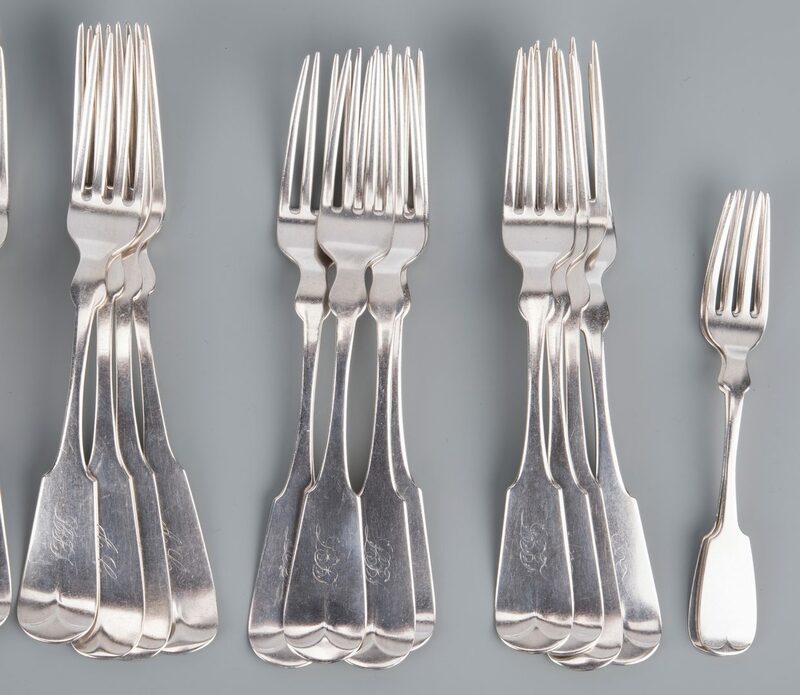 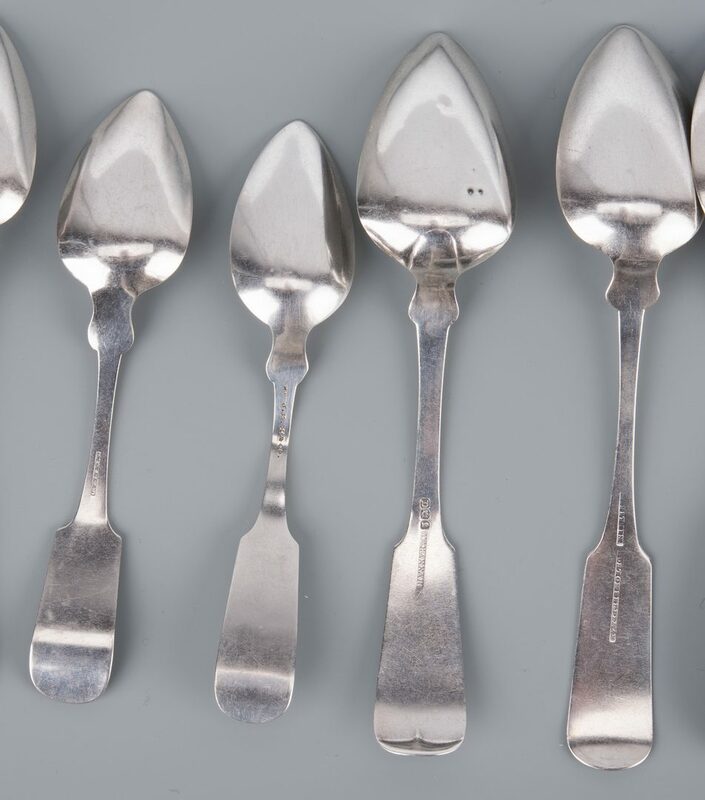 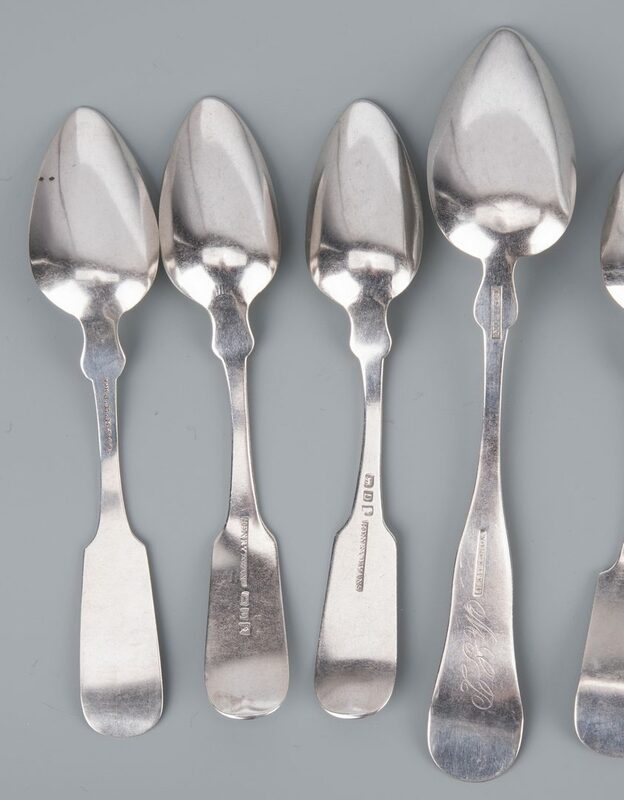 CONDITION: Some wear to fork tines, scattered small dents: Oakes tablespoon has significant wear to bowl, some other spoons slightly bent and worn; wear to monograms.